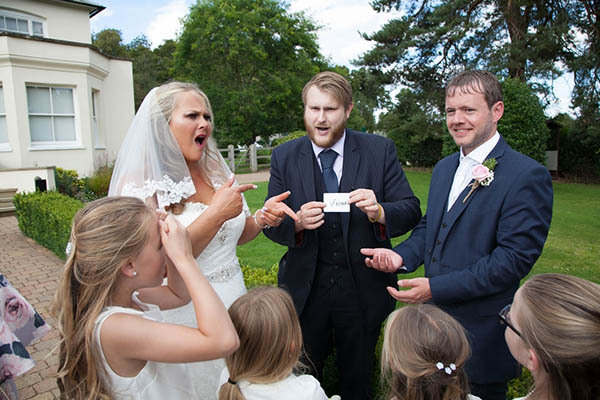 Christopher Whitelock is a professional wedding magician based near London. He has performed at weddings as well as parties and corporate events across London, and all over the world and at private parties for celebrities such as Sir Paul McCartney and Hugh Grant. Your wedding is a special day, so let a London wedding magician add a touch of magic that will make your day extra magical. Magic is a fantastic way of breaking the ice between your friends and families, especially if this is the first time they have all met. It promotes laughter and chatter and can provide a great energy boost to the whole room. The most popular times for wedding magic are at the drinks reception whilst the happy couple are busy having their photos taken, around the tables between courses at dinner, and at the beginning of the evening when venue staff are getting the room ready for you to dance the night away. Renowned international magician Christopher Whitelock can be hired for magic performances in London. If you are planning your wedding, corporate dinner party or black tie event and want to hire Chris to add some professional magic that will leave a lasting impression on your guests, please to to the contact page for booking information. London wedding magician, Christopher, knows that your wedding is very special and he can bring his amazing close up magic skills, such as mindreading and pickpocketing, to entertain your wedding guests throughout the day. Ideal times for magic performances on your wedding day include: the time you are having your wedding photos taken because mix and mingle magic is the perfect ice breaker creating magical memories; during the wedding breakfast with Christopher’s contemporary table magic; and performing in the transition period between day and evening reception, making it the perfect way to kick off the night. Professional wedding magician Christopher’s unique skill and flair will guarantee to wow and amaze you, your friends and family members of all ages making your wedding party extra special. Chris has performed magic at various small and larger wedding venues across London including Brown’s Hotel Mayfair, Chiltern Firehouse Marylebone, Claridge’s, Four Seasons Hotel London, Grosvenor House, Ham Yard Hotel Soho, Mandarin Oriental, The Beaumont Mayfair, The Berkeley Hotel Knightsbridge, The Bulgari Hotel, The Connaught, The Dorchester, The Goring Belgravia, The Ivy, The Landmark, The Lanesborough, The Langham London Marylebone, The Ritz, The Savoy and The Waldorf Hilton London. Christopher has a range of wedding packages on offer so please get in contact to discuss your requirements for your London wedding on 07747 141 238 or contact him here. We had Chris performed between the reception and breakfast. He came highly recommended and did not disappoint. He is the best magician I have seen in a very long time. His customer service was 2nd to none! He was absolutely brilliant and all our guests were blown away by him. Cheers echoed through the venue after every trick. A very friendly, fun and enthusiastic entertainer. A wonderful addition to our special da. A massive thank you once again for entertaining everyone on our big day on Saturday. I knew instantly I had to book Christopher after watching his videos, reading his reviews and talking to him on the phone. It was the BEST decision we made. Christopher created a special package just for us that fitted in perfectly with what we needed, entertaining during the meal and our evening reception. Christopher also performed a special trick for my husband and I that truly took my breath away. Christopher is a charming friendly and extremely talented magician, our guests have not stopped talking about his baffling tricks. If Christopher is available BOOK HIM you won’t be disappointed – worth every penny.